Cytokines are secreted, low-molecular-weight proteins that regulate the nature, intensity and duration of the immune response by exerting a variety of effects on lymphocytes and other immune cells. Cytokines play a key role in modulation of immune responses. Cytokine networks regulate lymphocyte turnover, differentiation, and activation. 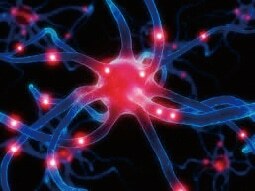 Many different cell types, in addition to immune cells, produce cytokines and express receptors for cytokines. Cell-to-cell communication (cellular “crosstalk”) is maintained via cytokine networks. In disease, these networks undergo imbalance. By measuring amplification or downregulation of cytokine signaling cascades in response to pathological insults or therapeutic interventions, it might be possible to evaluate disease progression or regression. Multiplex formats for cytokine profiling are now available and appear to be especially useful in monitoring cytokine profile alterations in a variety of human diseases. Structural studies have shown that the cytokines may characterized belong to one of four groups: the hematopoietin family, the interferon family, the chemokine family, or the tumor necrosis factor family. According to the main function, cytokines may also be classified as: interleukin (IL), interferon (IFN), tumor necrosis factor (TNF), colony stimulating factor (CSF), growth factor (GF) and chemokine. The biology of cytokines is complex and, although new information emerges almost daily, much still remains to be learned. Cytokines share many characteristics with hormones. Although classical polypeptide hormones are produced by specialized cells, cytokines tend to be secreted by less-specialized cells, and often many different cell types produce the same cytokine. Figure 1. 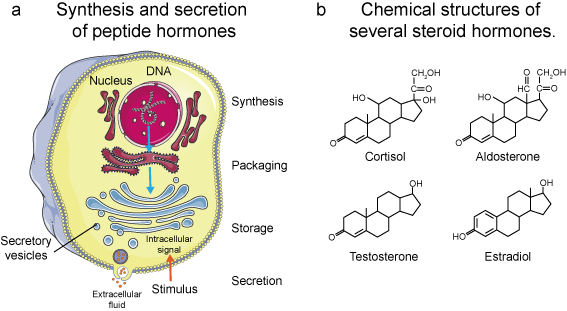 Synthesis and secretion of peptide hormones (a) and Chemical structures of several steroid hormones (b). 3. By acting on genes. Polypeptide and Protein Hormones Are Stored in Secretory Vesicles Until Needed. Most of the hormones in the body are polypeptides and proteins. These hormones range in size from small peptides with as few as 3 amino acids (thyrotropin-releasing hormone) to proteins with almost 200 amino acids (growth hormone and prolactin). Protein and peptide hormones are synthesized on the rough end of the endoplasmic reticulum of the different endocrine cells. They are usually synthesized first as larger proteins that are not biologically active (preprohormones) and are cleaved to form smaller prohormones in the endoplasmic reticulum (Figure 1a). Steroid Hormones Are Usually Synthesized from Cholesterol and Are Not Stored. The chemical structure of steroid hormones is similar to that of cholesterol, and in most instances they are synthesized from cholesterol itself (Figure 1b). Although there is usually very little hormone storage in steroid-producing endocrine cells, large stores of cholesterol esters in cytoplasm vacuoles can be rapidly mobilized for steroid synthesis after a stimulus. Much of the cholesterol in steroid-producing cells comes from the plasma, but there is also de novo synthesis of cholesterol in steroid-producing cells. Because the steroids are highly lipid soluble, once they are synthesized, they simply diffuse across the cell membrane and enter the interstitial fluid and then the blood.